What is the craziest thing you have done in your Jeep? Like with the previous blog entry, the fans on XtremeTerrain Facebook Fan Page got me laughing and feeling proud to be a Jeeper”, not that I wasn’t already proud, but you know. Anyhow, I had asked on the fan page what was the craziest thing you have ever done in your Jeep and rather then lose the responses, I wanted to share them with everyone..
Now, I am sure everyone probably already knows which crazy thing received the most responses.. the naked winter jeeping! Join in on the fun! 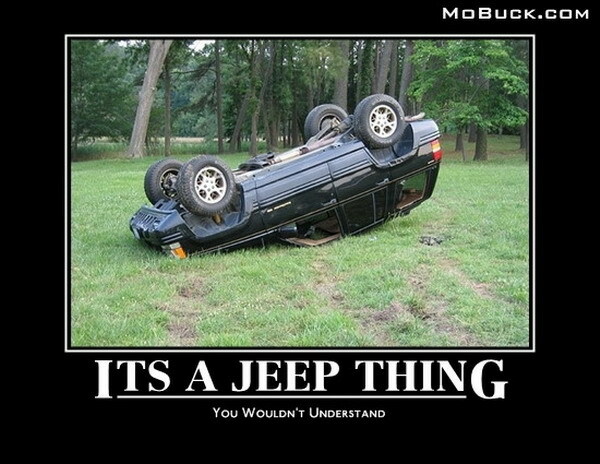 We would love to hear about the craziest thing you have ever done in your Jeep! Next Entry If you could off road anywhere, where would it be? The front seat of a Jeep is pretty tight quarters, but not too tight. Come to think of it, I’d better not say, or maybe I’ve already said too much. OK, I’ll tell. I got locked out of my place and had to sleep in the Jeep. All of my camping gear was in the back so I made do with the front seats. In case you’re wondering why I didn’t just roll the sleeping bag out, it was pouring cats and dogs! That probably would have been the summer I got too far out into the surf and the darned Jeep took off on a big wave like a boat. Thankfully there was someone nearby who was able to tow me back in. I did find out that my Jeep does not float too well. Thankfully, a good drying out and it was ready to rock and roll again. I drove it out onto a frozen lake and spun circles in the snow. I actually heard the ice crack and I headed for the nearest edge as fast as I could go. I had been drinking and was obviously not in my right mind! When I first got my Jeep I wasn’t real good with a standard transmission. I was trying to show off for a couple of girls that were watching me and I revved up the engine an took off. The only problem was, it was in reverse and I ended up hitting a tree. I don’t think their laughter could have been misconceived as admiration. That would be the time my idiot husband wanted to ‘test’ the rollbar. Thank God it worked like it was supposed to. He didn’t tell me ahead of time what he was going to do, so I was along for the ride. He did make sure I was belted in. That probably should have been my first clue.